One should always wear long-sleeve shirts with a suit. In this case, “sleeveless” means short-sleeve. 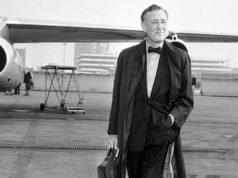 Short-sleeve shirts are always casual shirts, though Ian Fleming himself wore them with his suits to both stay cool in Jamaica and to avoid dirty cuffs. On most people, wearing a short-sleeve shirt with a tie gives off the low-level office-worker look, like Dilbert. Though I’m sure Bond is able to pull it off a little better. To all those who don’t approve of Daniel Craig wearing jeans, Fleming himself approved jeans, but in black canvas. He never mentioned denim on Bond. These canvas jeans are perfect for a rough mission in the Caribbean. I think the "all those who don't approve of Daniel Craig wearing jeans" bit was directed at me, so, I can only say that his clothing faux pas' are not confined to jeans alone (his garish shirt over a dirty t-shirt and and beat up trousers at the beginning of "Casino Royale" was another disaster). I just don't, personally, find that the clothing of either Craig or his equally humourless predecessor Timothy Dalton, fitted the bill as 007. The aggressive and uncharming attitude sported by Craig also leaves a lot of old time 007 fans cold. Connery looked equally dangerous but tempered this with an easy, natural charm and didn't run around looking permanently as if he had some uncomfortable bowel ailment . So, to the jeans specifically. 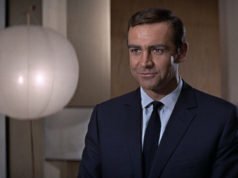 If they had followed the literary interpretation of Bond with jeans and short sleeved shirts under "old" suits then there wouldn't have been the stylish cinematic hero we all know and (at least in some interpretations!) 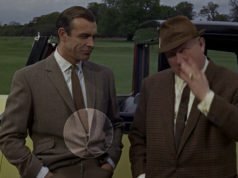 love or, for that matter, the opportunity for an excellent blog entitled "The Suits of James Bond". The literary Bond and the cinematic version moved further and further apart since the first movie and this applied to the adaptations of the source material as well as other aspects such as clothing.In some aspects this worked and in others less so. David, while I know you haven't seen Quantum of Solace, he spent most of the movie in suits (6 different tailored outfits). And his choice of casual clothing was more appropriate than in Casino Royale. The problem with the increase of casual clothing comes with the change in character: from a business man and spy before to mostly an action hero now. Daniel Craig is a capable actor being wasted on too many action scenes. The less action, the more tailored clothing makes sense. But I'm thankful that the films have a more varied wardrobe than the novels. For the most part, Fleming had a strict uniform for Bond. Since I only ever seem to comment with asperity, let me (before I forget) begin by complimenting you, Matt, on this remarkable blog, which happily relates to my current research and is always a stimulating read — both when I agree with you and when I don't. But as to the short-sleeved shirt's evoking an "low-level office-worker look" when worn with a suit, I can't agree — unless you only mean today in a US context. I'm not at all sure this would have been regarded as gauche or déclassé in the kinds of circles in which Bond moved. I don't want to suggest that Fleming's/Bond's peculiarities of taste are anything other than just that (and this applies to the lightweight worsteds and moccasins too). But quite apart from the obvious advantages of the short-sleeved shirt in the warm climate (and arguably also for a secret agent who needs to be physically unencumbered), this kind of "solecism" makes sense to me in social context. Impatience with anything "fussy" was very marked among people I remember of my grandparents' generation (a little older than Bond and slightly older than Fleming) from Fleming's walk of life, which is to say Tories with landed gentry or aristocracy in the family — especially the ex-military. From my childhood I remember a couple of old boys, back from India or Africa for a decade but *still* wearing short sleeved shirts under tweed, flannel or whipcord. While there is, of course, a sense that the right people (i.e. those who are "U" rather than "Non-U" in Nancy Mitford's terms) will know how to dress "right," my experience is that for anything except full dress and court dress there was a lot more latitude for what's "right" among the upper ten than one might expect — and certainly a lot more than among the middle classes. In fact, I would go so far as to say that sartorial etiquette, like most other kinds of etiquette, is probably a Victorian, urban-middle-class invention. I can't imagine members of the classes finding it necessary to worry about such things — because "right" behaviour was understood to be born, not learned. Daniel Craig's character is actually quite in line with what Fleming envisioned Bond as. I like the white canvas jeans and light blue tennis shirt in the movie better than what is described here.